The founding of a new Masonic Lodge in Dundonald, later to be named Lodge Burns Dundonald and to be granted the historic number 1759 - the date of Robert Burns' birth, came about in the following manner. On Tuesday, 11th September, 1984, on returning to Dundonald from a meeting of Lodge St. John Kilwinning No. 22, Brothers F. McCafferty, T. McGuffie and A. Howie discussed the possibility of setting up a new Masonic Lodge in the village. On the following evening, at a meeting of Lodge Irvine Newtown No.1662, they sought advice on the procedure they would have to adopt. They then canvassed support from Freemasons in Dundonald. On 8th October 1984, Brothers A. Howie and F. McCafferty, attended a meeting a meeting of Lodge St. Matthew Kilwinning No. 549. After that meeting they consulted Bro. Adam Pettigrew of the Provincial Grand Lodge of Ayrshire. He in turn sought the view of Bro. John Weir, Provincial Grand Master. After hearing of the work already done, the Provincial Grand Master advised the Brethren concerned to convene a meeting of interested parties, which he would attend. Brother Adam Howie approached the Rev. David Ness, the Parish Minister for the use of the Church Hall on Sunday, 18th November, 1984. Permission was granted by the Church Board, one of whose members, Bro. Archie McNicol of Lodge Dunoon Argyll No.335, was also local correspondent for the Kilmarnock Standard. He announced the upcoming meeting in his column, with the result that there was an excellent attendance when the meeting opened at 2 p.m. on Sunday, 18th November, 1984. The meeting was chaired by P.M. Bro. Alex. Davidson, also present, the Provincial Grand Master, Bro. John Weir and Provincial Grand Secretary, Bro. John Ralston. D. Blair 86, R.J. Gault 776, W. Shedden 505, W. Wilson 86, A. McNicol 335, J. McMurtrie 202, H. Anderson 86, R. Cameron 549, H. Richmond 86, W. Murray 86, R. Irvine 549, G. McVie 202, D. Richmond 86, W. Findlay 566, T. Lugot 109 , A.Davidson 505, T. McGuffie 22, J. Ralston 202, D. Hynd 126, T.P. Ness 180, J. Weir 135, A. Gouck 51, R. Picken 22, W. Crawford 86, G. Holmes 1334, J. Gaw 86, A. Pettigrew 133, C. Lancaster 204, R. Trotter 1561, A. Cunningham 126. Bro. Weir made the following points. It is not possible to get an automatic Charter, both furnishings and jewels have to be bought. A new Lodge must be supported by at least two existing Lodges. Bro. Weir felt that a Dundonald Lodge was a viable proposition with a good catchment area to be tapped. He said the following questions have to be asked: Is there an interest in Freemasonry?, Have any present had Office-Bearer experience?, the answer being positive in both instances, Bro. Weir said that a petition should go to the Provincial Grand Committee, a recommendation would then go from that committee to Provincial Grand Lodge. In a show of hands the meeting showed itself committed to going ahead with the preliminaries. Bro. Weir then displayed a petition form and a list of notes which regulate the filling in of this petition, by-laws have to be drawn up and two copies submitted with the petition. Other points made by Bro. Weir ; Founder Members would have to seek permission from their Mother Lodges. Founder Members could become Office-Bearers as long as they were not holding office in their Mother Lodges at the same time. The R.W.M. of a new Lodge is invariably a Past Master of another Lodge, it is best that all three Senior Officers should be Past Masters. When I was at a meeting of Lodge St. John Kilwinning No. 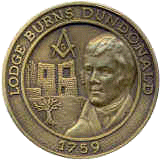 22, on Saturday 12th November, one of our Brethren mentioned the possibility of the establishment of a new Lodge in Dundonald, and he informed me that it was the hope of the Brethren that the Lodge would bear the number 1759 - the date of Robert Burns birth. Perhaps you would advise the Brethren concerned that we are presently at 1754 and if the present rate of Charters remains as it is as present, it will be at least a year before the number 1759 would be available. I would suggest, therefore, that the Brethren concerned proceed with the establishment of the Lodge, but leave the preparation of the application for a Charter to me, when I would place it before Grand Committee at the appropriate time, so that the lodge would receive the number 1759. Brothers A. Davidson, A. Cunningham P.M., J. McMurtrie P.M., R. Cameron P.M., J. Gaw, G. Holmes, A. Howie, R. Picken and W. Wilson. Brother A. Howie was appointed secretary Pro. Temp.. After the first meeting of the committee had been agreed for Tuesday 27th November 1984, the Chairman brought the initial meeting to a close. At the first meeting on 27th November it was decided to ask Lodge St. John Kilwinning No. 22 and Lodge Troon Navigation No. 86 to sponsor the new Lodge. It was decided that the Founder Members fee be £20, it was decided that, owing to the existing lets of the Montgomerie Hall, the regular meeting night would have to be Tuesday. Brother J. Gaw proposed that the name of the new Lodge would be Burns Dundonald, Bro. A. Howie seconded. The committee met again on Sunday, 2nd December 1984 and drew up the by-laws and refer the reader to the copies of the by-laws on file and in the hands of the Bro. Secretary. At a steering committee meeting held on Tuesday 18th December, 1984, Bro. John Ralston P.M. was congratulated on the job he had done in compiling the by-laws. At an informal meeting held on 20th January 1985, a letter was read from Lodge St. John Kilwinning No.22 intimating their intention to sponsor Burns Dundonald, a letter was read from Lodge Troon Navigation No. 86, intimating that they would require more information before making a decision on sponsorship. At a meeting held in the Dundonald Inn on Tuesday 5th February 1985, the first office-bearers were nominated, the first R.W.M. was Bro. Adam Cunningham, the others are listed in the first (blue) minute book of proceedings. At the same meeting it was agreed that the Lodge would meet every second Tuesday starting on 19th February 1985. At the meeting on 19th February it was reported that Bro. John Ralston P.G. Sec., had already begun the task of preparing the petition to Grand Lodge. At the next meeting on 5th March it was decided that we invite Lodge St. David (Tarbolton) Mauchline No.133 and Lodge St. James (Kilwinning) Tarbolton No.135, to join Troon Navigation No. 86 and St. John Kilwinning No. 22 as sponsoring Lodges, all four accepted the invitation. On 19th March 1985, it was agreed to use the Burns check. Our Ballot box was presented by the Preceptory and Priory of Moira Union. On 2nd April 1985 a cheque for £100 was received from Lodge Thistle No. 127. On 16th April it was learned that the petition had been granted. On 23rd April the office-bearers learned that No. 1759 was definitely being reserved for Lodge Burns Dundonald. On 30th April, R.W.M. Elect Bro. Adam Cunningham reported that the Lodge had received the stamp of approval from Provincial Grand Lodge, who had donated £25 towards the cost of the Charter. On 14th May, a letter was received from Lodge St. James (Kilwinning) Tarbolton No.135, intimating their intention to donate £500 to found 1759's benevolent fund. At a special meeting on Sunday 16th June 1985, a letter was read from Grand Lodge intimating that they required a list of our founder members (91) and their Mother Lodges, the letter also indicated that there would be only room for 44 names on the scroll. It was decided that these would be the 24 elected Office-Bearers, 2 Auditors, 2 Brethren elected to Committee, the Provincial Grand Master and the first 15 Brethren to pay the founder members fee in full. On 18th June 1985, Bro. Secretary sent to Grand Lodge a cheque for £205.07, made up as follows:- Petition £40, Founder Members at £1/head--£91, Annual fees for 91--£47.32 and VAT £26.75. On the same date a cheque for £25 was received from Lodge Burns St. Mary No.505. On 25th June 1985, R.W.M. Bro. Adam Cunningham announced that our application to become a Lodge under the Scottish Constitution had been approved unanimously, and that the Grand Master himself had expressed his pleasure at the erection of a new Scottish Lodge. On 30th July, R.W.M. Bro. Adam Cunningham told the Lodge that he had booked the Tarbolton Masonic Lodge for the erection ceremony on 11th October 1985. Later the Lodge was to learn with great satisfaction that the Grand Master himself would perform the ceremony. A price was sought for Mark pennies but on learning that the 'die' itself would cost £100, four Brethren of Lodge Thistle No.127, Stewarton, said they would pay for the 'die'. In the event the price charged was £185, but the balance was borne by a Burns Dundonald Office-bearer who wished to remain anonymous. The list of gifts to the Lodge from other Lodges and from individual Freemasons is much to long to be detailed here, but all are listed in the minutes and a list, together with the lists of Masons attending the erection meeting at Tarbolton on the 11th October 1985, is filed under that date. Last Friday in the Masonic Temple, Tarbolton, the consecration and erection of Lodge Burns Dundonald No. 1759, was preformed by Bro. J. M. Marcus Humphrey of Dinnet, Grand Master Mason of Scotland. He was accompanied by a deputation from Grand Lodge, and from the Provincial Grand Lodge of Ayrshire, headed by the Provincial Grand Master Bro. John Weir. Some 300 Masons from all over the country came to Tarbolton, and one person said the village had never seen so many cars on its streets at any one time. The spacious Temple of Lodge St. James (Kilwinning) Tarbolton No. 135, was unable to hold everyone, but video cameras relayed the ceremonies to the overflow hall. The interest that the erection of a new Lodge had aroused among Masons was intensified by the fact that the Grand Master himself was taking charge. In a speech after the ceremony, the Grand Master spoke of the inherent benevolence of Masonic Lodges, and made the point that this benevolence was not restricted to Masons and their dependants but extended to people of other beliefs. Lodge Burns Dundonald proved his point the week before by giving £40 and two sweaters to be auctioned in the Kilmarnock Standard auction to raise funds for a Catholic hospital in Uganda, and I made a note to send last weeks Standard to the Grand Master. Before leaving the Temple he remarked on the thrill he had felt sitting in the Masters chair- the very chair which Robert Burns had graced when he was Master of the Lodge. After the ceremony 200 Brethren went to the adjacent Civic Centre for dinner. After the loyal toast, Bro. John McMutrie, Senior Warden of Lodge Dundonald, proposed the toast to the Grand Lodge of Scotland. In reply, the Scots Canadian landowner and farmer from Dinnet, Aberdeenshire, captivated his audience by his rhetoric. Bro. John McMutrie surprised him by presenting him with a cheque for £300 for Grand Lodge charities, or such a purpose as the 250th anniversary of Grand Lodge, from the Right Worshipful Master, office-bearers and Brethren of Lodge Burns Dundonald No. 1759. The toast to the Provincial Grand Lodge of Ayrshire was proposed by Bro. William Clark, Junior Warden of Burns Dundonald, and replied to by Bro. John Weir, Provincial Grand Master. Bro. W, McFall, R.W.M. of the host Lodge, proposed the toast to Lodge Burns Dundonald No. 1759, and the reply was by Bro. Archie McNicol, Lodge Secretary. R.W.M. Bro. Adam Cunningham proposed a vote of thanks, particularly to Lodge St. James No. 135, who, in addition to being hosts, provided stewards and other services so that the Brethren of the new Lodge could be free to enjoy the evening. The toasts were interspersed with Scottish songs by Bro. G. McIvor of Lodge Mother Kilwinning No. 0, accompanied by the Dundonald Lodges own talented organist, Bro. Brian Thomas. The late Bro. Archie McNicol, who wrote all the information on this page was a stalwart member of this lodge for a good number of years and we were very fortunate to have him as Lodge Secretary for a time, a job to which his talents were ideally suited, he is sadly missed.